3 So, Are Massage Chairs Worth the Money? 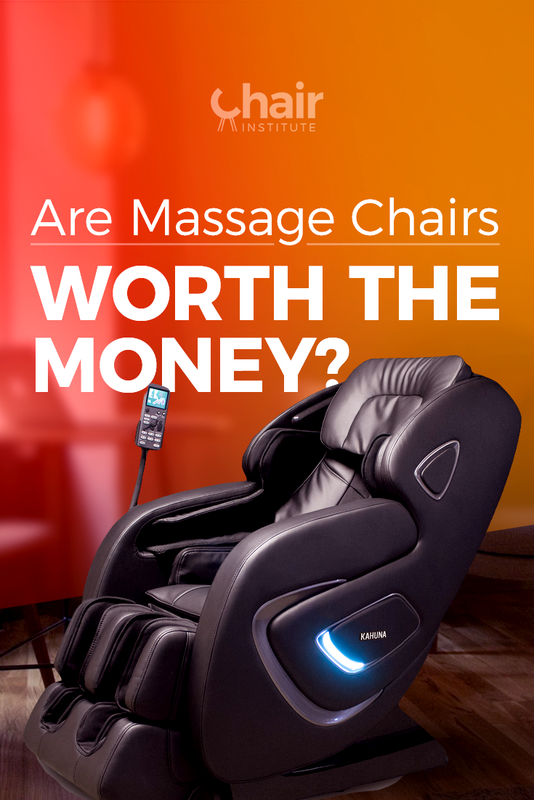 It’s a question we get quite frequently here at the Chair Institute because let’s face it, even an “entry level” or budget-priced massage chair is going to set you back somewhere in the neighborhood of a thousand dollars or more. It’s not like heading down to the local Wal-Mart and plonking down a ten-dollar bill to grab a folding chair to toss on the front porch. Even the most basic, stripped down models represent a significant investment, so the question, “is a massage chair worth it?” is, we think, an entirely fair one. The short answer is, “it depends,” but that’s not very satisfying, so we’ll go into more detail just below, outlining what kinds of things it depends on. To accomplish that goal, we’ll approach that question using a simple pro and con methodology and see where your particular situation fits along the spectrum. Let’s get to it! Let’s start with the negatives, and here, the biggest issue is the upfront cost. These chairs can range from around a thousand dollars to as high as $12,000 or more. Particularly at the high end, this starts to get prohibitively expensive unless you’ve just got piles of money lying around. You can buy a great used car for that kind of money! So, if you’re looking for a massage chair priced at the mid-range (around $5k or so) and up, you’re talking about a significant one-time investment sitting in your living room. How many people do you know who have spent hundreds, if not thousands of dollars of a Bowflex in-home weight machine, a Stairmaster, a deluxe rowing machine, stationary bike, or any number of home fitness equipment, only to have it collect dust in the basement, where it sits, largely unused for years at a time? You may have made a few purchases like that yourself. If so, you should know that this is just like that, but on steroids, because it’s a lot more expensive. To get any benefit out of a chair like this, you’ve got to use it. The more expensive it is, the more often and regularly you have to use it to make it pay for itself. If you’re not sure you will, then no, it’s not worth the money to conduct a real-world experiment on yourself and your bank account. A good rule of thumb here is to consider the price of a typical chiropractic visit. This varies from one part of the country to the next, but we’ll use an average of about sixty bucks a visit. So start by dividing the price of the chair by sixty. If you’re looking at a $6000 chair, then it’s going to “pay for itself” at 100 chiropractic visits. The next question is, how often do you go to the chiropractor? If you’re going once a week, that’s 52 visits a year, so in 12 years, your chair will have paid for itself. That’s a long time, and looking at it through that lens, it’s hard to justify the upfront cost of the thing. The second thing to talk about here is the diagnosis you have or treatment you need. Massage chairs are (depending on their specific features) excellent at helping people with chronic back, and leg pain feel better. While some models are capable of giving a respectable neck and shoulder massage, you’re never going to get a massage chair that can give you a neck adjustment the way a chiropractor can, so depending on where you hurt, massage chairs may not be very good at addressing your problem, or making you feel better. In that case, there’s little to be gained by spending the money. Then there’s the human vs. machine difference. No matter how good a chair-based massage feels, nothing can replace human hands and experience. A talented massage therapis﻿﻿t can zero in on problem areas and solve them much more quickly and effectively than even the most expensive massage chairs, which, at the end of the day, simply follow their programming. Most people don’t go to the chiropractor more than once a week, so we can use the same math here that we used above, but the math doesn’t tell the whole story, does it? What happens if you slip in the shower at nine o’clock on a Tuesday evening, wind up hurting your back and need some immediate relief? You’re not going to find it in the ER, and you’re not going to just be able to walk it off, but if you own a massage chair, you can just sit down and order up a cure, any time you need it. What happens if you’ve been on vacation, drove all night to get home, and pull into your driveway at two in the morning with your back feeling as though you’ve been beaten by a colossal man wielding a lead pipe? Again, good luck finding a chiropracto﻿﻿﻿r who will open up the office and attend to your needs then and there. What we’re talking about here is, in essence, the issue of convenience. You can enjoy a soothing, therapeutic massage from the comfort of home, on your schedule, any time you want to, and there’s value in that. It may be hard to put a dollar value to it, but it’s hard to deny its value. Convenience aside, there are some things that a massage chair can do that a personal massage therapist can’t, or can’t easily replicate. Heat therapy. Multiple simultaneous massage techniques. Music and chromotherapy combined with your massage. All of these things are standard fare for a variety of massage chairs, and what those devices lack in human skill, they make up for in other ways. The quad rollers used by today’s massage chairs closely mimic the feel of human hands, and millions of research dollars have been poured into creating human-like massages. Granted, they’re not perfect, but in many cases, you’d be hard-pressed to tell the difference, and because of that, they wind up providing most of the same benefits you would get by making use of a personal masseuse. Again, a large component of the arguments for massage chairs comes down to how often you typically go to the chiropractor, and where you hurt. C﻿hronic back﻿﻿ and leg pain﻿ are the most common kinds of chiropractic injuries, and if you suffer from either, and go to the chiropractor at least once a week, you’ll find the payback time to be within an acceptable range, especially when you factor in the convenience. Also, don’t forget that other members of your household can use the chair too! That’s important because if you’ve got two members of your family making regular visits to your local chiropractor, then the payback time is dramatically shortened. So, Are Massage Chairs Worth the Money? This, of course, brings us back to the central question: Are massage chairs worth it? We certainly think so, but your answer will depend heavily on how much emphasis you place on the convenience factors and how often you make use of human alternatives. If you have any questions or thoughts, please share them in the comment section below. We will read and respond to them. I am a PSW …so you can understand without a picture the bending and standing on feet and lifting for 8 hours a day sometimes…I am having issues with lower back stress, hip tension, feet…not to mention arthritis. Is this good for people with arthritis….ex. roller pressure on muscles, lower back. I tried one at The Brick store today….I found the pressure of the rollers rough….is this adjustable? With this informati0n in mind, what kind of chair do you suggest… I like the music idea in the chair…being a classic music listener…. If I was to negotiate a sale for a therapeutic chair (I measure 6 feet…but I have wide hips and thighs….and I notice from the chairs I tried, that the space for the legs is not very wide…Are they all like that? Hi Gisele, and great questions! The “right” massage chair can definitely help with lower back, hip, and foot pain, absolutely! And the rollers can help a bit with arthritis pain too, in much the same way a massage by a human can help relieve that pain. Some low-end massage chairs don’t offer any means to adjust the intensity of the rollers, but virtually all of the name brands do, yes. From your description, it sounds as though a massage chair with built-in heat would be of tremendous benefit for you, although if you’re having trouble fitting well into the chairs you’ve tried, then you’re absolutely correct that the field is a bit narrower. We’d recommend looking closely at Kahuna chairs. They’re a great company, and they make several chairs designed for big and tall folks. Two models, in particular, come to mind: The Kahuna LM-6800 is hands down the best value on the market today, and it’s got a surprisingly robust set of features, given its modest price. If you’ve got some money to spend, then the Kahuna SM-9000 is the way to go, in our opinion. While both models are designed to accommodate taller users, the SM-9000 is a bit wider as well, and provides an incredibly comfortable seating experience, in addition to rendering an exceptional massage. Also note that the SM-9000 utilizes heated massage rollers, which is a nice touch because most massage chairs offer heat only in localized areas. Heated rollers provide that magic combination of heat and massage wherever the rollers can reach, and that’s outstanding. Both chairs also have an outstanding body stretch program, although (and this might be surprising), we think the cheaper LM-6800 offers the better foot massage experience. The SM-9000 uses airbags only, while the LM-6800 uses a combination of dual rollers and airbags. Both models are exceptional, however. Thank you very much for your inquiry and please keep us up to date with your decision and experience. If you have further questions, don’t hesitate. thank you for the information…I am really interested and working some Financial alternative for this investment that I think I would benefit. I have one last question. When I tried a chair here in Sudbury, I noticed that the rollers where kind of hard on the back and hurting…is this normal… I am concerned that tolerating this kind of pressure might be a nuisance to my back…I am concerned about this if I buy a chair…What do you suggest? Does anyone else every complained about such an issue to you? Hi Gisele, and happy to help! Yes, sometimes the default setting of the rollers can be a bit much for some people. Almost all name brand chairs (including the two we mentioned earlier) allow the user to control the intensity of the rollers, which lets you dial it down to a level that’s more comfortable for you. I am Portuguese and a few years ago I acquired a model EC-585-C shiatsu chair. The company that sold it to me, does not exist anymore and I can not get anyone to give me technical assistance. The chair is in preferential conditions, but I can not use it because the two plastic terminals responsible for filling the air in the back have broken! I have some photos of it and of the chair it self, that I would like to show. Please, can I have an e- mail of yours, where I could put the photos in the e-mail attachment , in order to get your help easely? Do you still have a contact here , in Portugal, that I can call ? I realy love your chair and I used to use it every day. I’m so sad! Coud you please help me? Thanks! Do you know who’s the manufacturer of that model? We suggest you contact them to see if they can provide the spares or replacements. We made a quick search and found a Chinese Company named Xiamen who sold an EC-585C model under the brand “4Massage”. Hope you can get a hold of them and solve your issue. Thank you very much for trying to help me. You were so kind! I already wrote to the company that you indicated to me. Now I I’ll wait for their answer, and as soon as I get it, I will give a feedback. Our pleasure Cristina. We wish you good luck!